An email survey issued by the American Academy of Orthopaedic Surgeons on Zumba related injuries had doctors, saying that they’re regularly seeing Zumba students complaining of ankle sprains, ankle fractures, torn meniscus, overuse injuries and more. 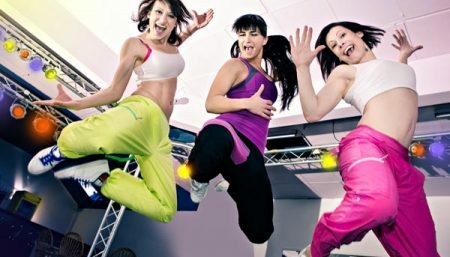 There is no doubt that Zumba is a great way of burning calories, say up to 500 calories/hour and staying fit. The exercise form definitely has certain risks involved if you are not in best of your shape. Some of the women who join, are overweight, and many have never learned how to squat or lunge properly. They don’t always lift their feet in the dance steps, so their hips or knees go in one direction while their feet stay put. With knee injuries requiring surgery, tears in the hip labrum, hip bursitis, ankle sprains, shin splints, heel spurs, and lumbar strain injuries from Zumba moves, it is time to reconcile and go slow. 1. Analyze your fitness level: A lot of people now-a-days are ready to try this exercise form even if they hate exercise because their friends tell them how much fun it is. Often these people are out of shape and try to keep up with the class landing up with injuries. Many of these women have never worked out before, some are overweight. To begin with, before starting of with zumba classes or any workout session, get a green signal from your doctor. Also, note newbies aren’t the only ones getting hurt, so you better watch your moves. 2. Prepare for Zumba Session: Take a prep class that teaches the basic moves or a beginner’s Latin-dance session before you show up at your first class. And if you’re a baby boomer, try to find a zumba class geared toward your age group. Do not ignore pain, slow down or stop dancing. 3. Wear the right shoes: Avoid slipping on any sneaker that you think will match your outfit for that’s not a good idea. Choose dance shoes because they pivot really easily and there’s a lot of pivoting in Zumba. For e.g. running shoes, are made for forward—not side—movement, avoid wearing them for Zumba for you stand a risk for hip, knee, and ankle injuries. It is important to find flexible shoes with the right amount of arch support. 4. Avoid dancing on Wrong Floor: Recently a number of Zumba studios have sprouted in converted church basements, school auditoriums, office buildings, and strip-mall storefronts. All floor types do not work well with zumba. Be wary of unforgiving surfaces such as concrete, concrete covered with a thin layer of wood, or floors with hard tiles, and avoid carpeted surfaces. Hardwood floors, which provide a certain amount of give, offer a good venue for Zumba. 5. Crowded Classes need to be avoided: In order to dance one requires some physical space. Classes that are too congested can cause people to run into each other or hit each other with a flailing arm or leg. Check out multiple facilities and various times of the day to find which classes are least congested. 6. Choice of Instructor: work with an experienced instructor who offers a choice of high intensity or low-impact moves. 7. Warm up and cool down. A good warm-up will help raise your body temperature, work your muscles, and reduce soreness afterward. A brief cool-down consisting of of lighter physical activity will help bring down your heart rate, respiratory rate, and body temperature. Zumba instructors often use music with a slower beat as the initial and final song to accomplish those goals. 8. Stretch and Relax: Stretching is critical for promoting recovery and decreasing muscle stiffness. Perform stretching exercises right after your zumba session when your muscles are at their warmest and most limber. Hold each stretch for a count of 15 to 30 seconds, pushing yourself until you feel a good pull in your muscle without any significant amount of pain. 9. Stay Hydrated: If you don’t replenish your internal water supply, you can easily become dehydrated-which in turn prevents your body from performing as it should. This is more of a problem for women than for men, because, unlike men, women tend to have more body fat than muscle. And body fat doesn’t hold water as well as muscle. Carry a bottle of water with you and stop for frequent sips. Humidity can add to your risk of passing out. Watch for lightheadedness and stop if you feel faint. 10. Modify & Adapt: Move at your own pace, and don’t get caught up with the whirlwind around you. Ask the zumba instructor to modify the steps according to your fitness level. The best part about Zumba is that you can always alter and modify moves to suit yourself; however, if you want to truly master the art of Zumba, you need practice, practice and some more practice. People with knee, hip or ankle problems should consult a doctor, as they may need to modify the routine — avoiding jumps, for instance, or fast hip movements. Injuries need to be prevented at every cost, for some of them can leave a strong impact on your body- tears in the hip labrum, hip bursitis, ankle sprains, shin splints, heel spurs, and lumbar strain injuries can be caused by Zumba moves. Watch Out.